A contestant in the Hammer Throw competition prepares to let fly. I can hardly say I am a "Scot." McKinney is one branch of my family, for sure, late of the Isle of Skye, where they reportedly assisted in an uprising or two and suffered because of their clandestine support, not well concealed, for Bonnie Prince Charlie. Nevertheless, with a "bonnie" amalgam of blood in my veins, Norman, Cornish, German, Scot, and who knows what else, I am nothing but an American mutt, and that is fine with me. However, I find Scottish culture a fascinating and beautiful thing. 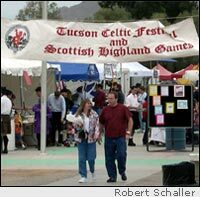 On Saturday, November 6th, Highland Games were held in Tucson. I went, but I did not wear a kilt. haggis! (No, I didn't.) I also discovered another delight bestowed on us by the Celts, the Ruben! Well, it's corned beef, you know, therefore Irish! A seafaring people, the Irish braved the North Sea and crossed the Channel. They picked up a bit of rye bread here and sauerkraut there, some Swiss cheese, and next thing you knew, there was the lovely Ruben. I was heretofore ignorant of this, so I ate one in joyous celebration. Afterward, there was much walking about, checking out various commercial tents and "clan" exhibits. There were sporting events for robust men in skirts (and for robust women as well). There was "tossing the caber" (apparently, "caber" is the Scottish word for "telephone pole"), "hammer tossing" and "putting the stone." In Scotland, frugality prevents purchasing "shot" when there are an abundance of large Scottish rocks just lying around, undisturbed. In a pinch, they are apparently allowed to use Tucson rocks as well. 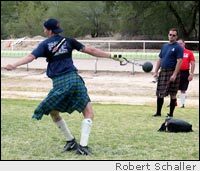 These men in skirts whirl around and fling these rocks down-field, attempting to be found the greatest rock flinger of the day. It's very interesting, but if you would be offended by the answer to the question "what is under a Scotsman's kilt," it's best to look away at the crucial moment. As this is potentially a matter of some delicacy, I will not elaborate further. The excitement of that battlefield was too much to bear, so eventually I scrambled across the grassy moor to the main event at any Scottish gathering -- this would be either the whisky tasting or the music of the pipes and drums. This day, it was the drone and skirl of the pipes and drums, as several corps put themselves out on our behalf. Pipes, as you know, were perfected by Scots for the sole purpose of scaring the English. As I saw no English venture onto the grounds, I assume pipes are well-fit to their purpose. In addition, the haunting tunes and cadences of the pipes and drums carried me swiftly away to the pines, mists, and stone of the Highlands, and a worthwhile departure that was. 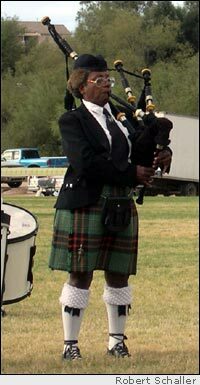 Back in Tucson, nearby, as the pipers and drummers of the Seven Pipes' Corps rested between their numbers, I watched Scottish dancers and a lone Irish girl of about 8 or 10, as each shared their well-practiced steps. Afterward, filled with the warmth of a mustard-anointed Irish Ruben and the ancient music of the pipes, I headed home to Phoenix. I feel somewhat sorry for anyone who cannot proudly claim at least a drop or two of Scottish blood!